The Legacy of Job’s Wife was a highly gratifying read for me. KS (14 Nov 2018)- By giving Ix’ises a happy childhood marred with loss and tragedy, in addition to her lack of belief and faith in any Supreme Being, the author is able to justify her behavior in the face of her ultimate loss and during her husband’s tribulations…All in all, this is a great book. Not only does it realistically portray the possible events that took place in the Book of Job, but it also presents pertinent issues including discrimination against people with deformities, the common behavior towards people who have fallen from grace, and the lack of initiative to help out the less fortunate citizens like orphans. While the most important part of the book is, naturally, the realistic portrayal of the life of Job’s wife, what I like most is the empowerment of women and handicapped individuals…It is well-written, touching, moving, and inspiring. I recommend it to readers who enjoy Bible stories and stories about rising above adversity. TA (16 Nov 2018)- The major themes in this story are love, faithfulness, forgiveness, etc. Written in the first person narration, this story provides room for experiencing the feelings vividly. I personally enjoyed this book just from the beginning. The story is narrated as a sweet memory that comes softly in Ix’ises mind. As I read this book, I felt as if I was actually travelling to the ancient time. The description of the scenes, landscapes, the journeys, their lifestyle, etc. gives me a taste of nature. It lets me escape today’s busy world filled with artificial things. And, it also helps me understand Job’s wife in depth. The author does a wonderful work by weaving a fiction out of a biblical character who is often cited as a negative example. Every scene seems to happen in front of my eyes. Particularly, the part where Job was sitting in the ashes heap was heartbreaking. TJ (21 Nov 2018) The Legacy of Job’s Wife flows like poetry and entangles the reader in the life of Ix’ises and her family. This is a love story at its best. It’s not only about the genuine eternal love that exists between Job and Ix’ises, but also the unconditional love that abides in only the best and closest families. It is written in a way that draws the reader in and makes them part of the characters’ lives, smiling at their joys and crying with their hardships. Ix’ises is a haunting character that will linger in your mind, at least until the next great book. The book flows seamlessly through the characters’ lives, which entices the reader to continue. Also, I enjoyed the short passages at the beginning of each chapter, which foreshadowed what was to come. While not an action-packed tome, it is easy to fall in love with the well-developed characters, and to remain curious about what will befall them next. I loved this book for its timeless story-line about eternal love and its historical details, however others who need action, adventure or are adverse to love stories may not be interested. R3 (26 Nov 2018)- The depth of emotion between Job and Ix’ises is amazing and profound…In biblical history, Job’s wife always seemed to come across as cold and harsh. This book…places the story of Job and Ix’ises within a relatable context. Now as a reader, one can understand the emotions of Job’s wife and her reaction to the situation. The author was able to bring to the forefront of the story, the intangible things that hold so much importance in everyone’s life; love, forgiveness, family, faith, fear and pain…I would recommend The Legacy of Job’s Wife to anyone who enjoys reading human interest stories about love, faith, forgiveness and family. This is definitely an amazing and emotionally moving book. I think anyone reading this would be enthralled by it. MA (28 Nov 2018)- While there are many aspects of this book that I enjoyed, my favorite thing would be how well Koelker described each character. I am always impressed when an author can portray their characters in such a way that allows their readers to visualize them. Even more so, I enjoyed being able to relate certain characters with people in my own life, including myself. MP (30 Nov 2018)- I do like the structure and writing style of the book. It is a prose but a dramatic and poetic prose, which makes it interesting. The story is suspense filled with foreshadowing events. Despite the fact that I had knowledge of Job’s life in the Bible, yet I was eager to know the aftermath of Ix’ises’s life end. To people who are novice of such story, I’m sure the suspense created in the story will arouse their curiosity while reading. MK (4 Dec 2018)- Upon reading The Legacy Of Job’s Wife by Cynthia Koelker, a fictional account of Job’s wife and her enriching life story in tragedy, romance, and everyday survival; I have found a beloved heartbreaking journey that will stay with me for ages to come. Ix’ises, Job’s wife, carries a childlike innocence and beauty by the grace of God. The life struggles God has laid out for her continue to shape and mold her inner and outer being into the truest of overcomers. In the midst of facing one battle after the next, hope begins to fade into hopelessness for her. Still, although the depression from life’s deepest well of sorrow takes its toll on her being, she finds her own self face to face with the inevitable twist of unseemly fate. She cannot give up for the sake of her companion Job. Although, she felt like saying “curse God and die”. Life altering events have a way of opening one’s heart again. A newfound joy and reason to live are all she needs to set her heart breathing again. Hope is with her now along with her trust in God. I love how Koelker weaved a very beautiful eventful story from the very beginning to the long awaited ending. Still, I wanted more. More, I tell you. I was in tears throughout this story and it was not a surprise to me to be left in tears come ending. This story has been a blessing for me to have read about the intimate thoughts of Ix’ises and her path taken from birth and into her late years. She’s a strong talented young woman who is capable. Indeed, I enjoyed watching her grow through the eyes of a reader. It was absolutely wonderful having an understanding of the secondary, tertiary characters, and so forth. Each character held great importance to the flow and telling of story. There was never a moment the stream did not flow for me. Although this story lacks some greater detail, I found the story moved along just right without it. There is much dialogue throughout the reading and it was a relatively easy read. The author’s effort by far has exceeded my expectations. Before I read this work, I was hesitant to take the leap into reading this novel. I’ll tell you why. The fictional account did not appeal as much to me but the topic appealed very much to my liking. Fictional as it may be, this story opened my mind to think more on the possibilities of the wonderful character being Job’s wife. It set my sights in living in times that were ancient. I could see the flowers being picked, the music in the air, the laughter from the characters. I became a part of the story it seemed. I’m sure that is why so many tears have streaked my face upon reading such a profound story as this one by Koelker. It is natural for me to tell you that I have enjoyed most the author’s writing so fluidly. I was deeply impressed with how greater details weren’t so necessary for the blossoming of this beautifully cultivated story. In my years of being a reader, I have never come across this kind of design before me. From the first pages to the last, I will keep close how the author has awakened in me a new beginning with precious thoughts about the possibilities of Ix’ises and all who moved her along on this journey we call life. K (9 Dec 2018)– This book is perfect for audiences who are open to new perspectives and with a goal to learn a side of a well-known story that can reach into your heart. It is a good fit for most adults and one that most can relate to. The moral and life lessons included in the book are exponential and something that we can all learn from, in particular, I found comfort in Job’s unending belief that all will end well in their lives. …It was phenomenally well written and edited, you do not just read the story of Job and Ix’ises, you live it. The only part that I did not fully enjoy were the quotes at the beginning of the chapters as they gave too much information about what was to come later on in the story, this still did not take away from the overall effect of this story. …Even though I am not coming from an overly religious background I feel like I understand the story of Job and now have a view of what could have possibly happened to Ix’ises to make her the way she was in her most desperate hour. I can say that this book has a way of reaching into your heart and making you think about your lives and how important it is to be grateful for all that you have. LC (11 Dec 2018)- Refreshingly, the best part of The Legacy of Job’s Wife is the main focus of the plot; the passionate romance between Job and Ix’ises. The hungry desire that Ix’ises has for her adoring husband is charmingly relatable. If you’re anything like me then you’ll be begging the love-struck girl to confess her feelings to the man of her dreams, who, coincidentally, struggles with the very same problem. The depth of Ix’ses heart will make you swoon for her as Job did. I applaud the author, Cynthia J. Koelker, for putting so much complexity into the love between the two main characters. Though The Legacy of Job’s Wife is focused, rightfully so, on Ix’ises life, of which Job is a large part, many other characters share the spotlight with them. Ix’ises younger brother, B’nahram, in particular, has a wonderful character arc. The numerous characters with enchanting stories and personalities will draw you into their world…You will smile when they prosper and, as is inevitable in a famous tale of loss, cry when they fall. I was pleasantly surprised by how much I enjoyed The Legacy of Job’s Wife. Romance is not a genre I have ever enjoyed, a trend this book bucks. I connected with Ix’ises and felt what she felt, leaving me awestruck with how invested I became in her tale. If you enjoy romances then you will like this book, something I feel can be said of fans of historical fiction as well. TW (12 Dec 2018)- I am a huge fan of “other perspective” books; the ones that tell a story from the point of view of another character, so I was very much looking forward to reading this book, and I was not disappointed. The biblical theme is what first caught my eye because I’ve heard the general idea of the book of Job in the Bible and it’s always astounded me that a person could lose so much, yet still be faithful to God. The idea of a book written from the perspective of Job’s wife was incredibly intriguing to me as she’s barely mentioned in the Bible, other than to tell Job to “curse God and die,” but she obviously had to go through the same things that Job did. That was the best, most moving, part of the book to me. Koelker wrote Ix’ises’s reaction to the deaths and disease that came upon their family and workers with such raw and real emotion, it felt like I was experiencing it myself, not just reading it. There’s plenty of criticism of Job’s wife’s one line of dialogue, but the way that the book was written made it a completely understandable reaction to what was happening to/around her. I was originally annoyed that the majority of the book was to do with what happened before the disasters, but once I reached that part of the story, I found that I cared so much more about these characters and what happens to them than I would have if the focus had been on those dark times. As I was reading, I was unsure how much this book would follow the biblical story as the vast majority of Ix’ises’s life is not mentioned at all in the Bible and would have to be made up for this story. However, the parts of the book that correspond to what is in the Bible are entirely accurate to the timeline. The way that each of the groups of servants and Job’s children died were the same as in the Bible, and even the tradition of tearing one’s clothes and shaving one’s head in times of struggle and grief, was true to history of the time. That close attention to detail made the book better. 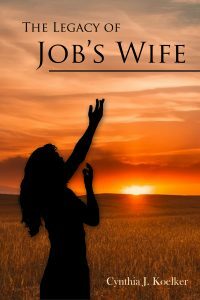 …Overall, The Legacy of Job’s Wife was a very well written and engaging book. Koelker did a great job bringing the characters to life and making the reader feel the same pains and joys that the characters were experiencing…This is a book that I would gladly reread. LB (13 Dec 2018)- It was truly a pleasure to read this book. It has been carefully crafted; the author strikes a lovely balance between in-depth storytelling and movement of the plot. Her prose often reads like poetry, adding a layer of decadence to a story already rich in detail. She uses a variety of colourful vocabulary, but not so much that it is overwhelming or too challenging. Also, there is just the right amount of religious undertone, leading the characters and the reader to contemplate God without preaching that they do so. Both novice and seasoned readers have something to gain from this novel, and are sure to enjoy it. I also enjoyed the fact that we get to witness Ix’ises’ life in full. We know her in birth and we know her well into old age. She experiences a vast array of emotions throughout her years, and I thought the author accurately depicted her human nature in all of her stages of life. Seeing her complete journey allows one to view their own life more clearly, finding hope in the possibility that their suffering is not in vain. If I have to pick out something that I didn’t like about the book, it would only be that I had trouble figuring out how to pronounce the name “Ix’ises.” It is not a familiar type of spelling in English, so I found it difficult to imagine how it should sound. Because of its many facets, I would recommend it to people of all ages, those who are curious about religion, and anyone who is struggling to get through a loss. S06 (13 Dec 2018)- The story starts at the birth of Ix’ises, Koelker’s name for Job’s wife. Koelker portrays Ix’ises and her family as non-religious in contrast to Job’s religious family…However, Ix’ises remains at the centre stage throughout the story and undergoes the most development. By the end, we are left to reconsider what the legacy of Job’s wife is. Would we maintain that she was a foolish woman who lacked respect for God? Or a human woman grieving her dead children and dying husband? Koelker addresses the question at the heart of the biblical account, why do bad things happen to good people more so when they serve an all-powerful benevolent God? It should be noted that the religious undertones of this story do not exclude non-Christian/Jewish or irreligious readers. Anyone who loves reading novels, or that is interested in the problem of evil or the process of grieving would find this story’s take worthy of consideration. The biblical account ends where Job’s losses are restored: his wife bears 10 children to replace the dead ones and Job’s fortunes return to him. However, I most appreciate that Koelker’s story goes a little further to show that the replacement of one’s fortune never completely replaces one’s prior loss. The new 10 children could never completely replace the dead ones. However, as Ix’ises and Job heal, they can find the strength to channel their irreplaceable loss into something beautiful and beneficial to everyone else. This is a message everyone needs to hear. P07 (15 Dec 2018)- Cynthia Koelker uses a narration style that relies heavily on conversation between characters; this is a big plus for this book. This style makes the story an easy read. The transition between the chapters is seamless, adding further to the perfect flow of the story line. The story handles everyday issues and moments in life in a very candid way hence making it a book for all. The euphemism with which the writer talks about issues of womanhood, male-female intimate relations in marriage and the process of birth makes the reader feel at ease, more so the more conservative reader.The writer expertly takes away the repugnance that may come with blunt explanations. The section about the misfortunes of Job, though well narrated, shows lack of creativity by the writer. This section reads like one taken out of the Bible…The writer stated at the beginning that is was a work of fiction; she should have gone a step further and come up with names of characters and places that did not match those in the Biblical account. All in all, this is a well written story that can be read by a wide audience. It resonates well with those who have at one time or other encountered situations in life that may have led them to question God. It presents life as it is, revealing its high and low moments. From it readers, can take home valuable lessons from the various characters. Virtues like patience, perseverance, persistence, love, hospitality and generosity are presented and can be powerful blocks in readers’ lives. It is a great book indeed. 56L (17 Dec 2018)- The author seems to have studied the book of Job in the Christian Bible and out of it came this masterpiece, a combination of great creativity and imagination. She uses Ix’ises as the story teller in the book and she does it in a captivating manner so that once you start reading it you cannot stop as you seek to find out what happens next. It is a book that dramatizes the experiences of the biblical Job in his life on earth, his trials, temptations, failures and victories. It is a narration of the power of unwavering faith in the Supernatural. This is a story of love and forgiveness. It is a story of trust (in God), suffering, loss and restoration. I believe that if the mind of a man is defeated, everything else around him will crumble. This is the story of a physically and materially battered person but who did not allow his mind to be defeated. It is about an extreme test of faith and endurance that a believer can be subjected to, which Job passed with flying colors. I fell in love with the book the moment I started reading it and I never stopped until I finished. Reading this book, to me, was like watching a well scripted and directed movie. It is a piece of art so perfectly done that I am looking forward to reading the author’s other books. This book paints a color picture of the biblical Job. Those who love reading the Bible will enjoy reading it more than those who do not believe in the existence of the God of heaven. Nevertheless, non-believers can read and still enjoy it just like any other works of fiction. EM (30 Dec 2018)- …Ix’ises’ story is beautiful and true to life, with such a wonderful realm of feelings weaved through the story. I was completely immersed in the writing…This book would work very well for a Christian or Jewish religious study as it does ring true with the Biblical story of Job. Ix’ises comes through as a real person. As the reader, I felt her pain, her happiness, her joys, her fears, her love, and her anguish as the events unfolded. The book made me both smile and tear up in different places. The emotional rollercoaster added to the already highly enjoyable read. Overall, this was an amazing book and I would look forward to read more of Ms. Koelker’s work. RM (31 Dec 2018)- The Legacy of Job’s Wife by Cynthia Koelker is a fictional biography of Job’s wife. Job’s wife was never named in the Bible, but there are several stories in Jewish folklore with thoughts as to who she might have been. Ms. Koelker brings her own idea to life in this enchanting, but very humbling, look at life through the eyes of Ix’ises during the time of Job . …Ms. Koelker’s story brings her characters to life, giving them each a distinctive personality and purpose in life. I appreciate the author’s ability to make life in those times come alive. Her descriptions of daily life, the area where they lived, and how they lived were so vivid that I could visualize the entire story. Although her treatment of Job’s trials was short, I understood that this was Ix’ises’ story and that Job was just one part of it. In my opinion, this is a flawless story, beautifully written by Ms. Koelker and edited by an exceptional copy editor. I could not find one thing I did not like about it. The Legacy of Job’s Wife had me so involved with the story that I had tears in my eyes much of the time. This book will appeal mostly to women. I feel that men might find it a bit too sentimental, but I would encourage them to read it anyway. I can envision parents reading it to their children, perhaps editing a few scenes. Even though it is a fictional story, it is so beautifully done that I think everyone will enjoy it. D11 (2 Jan 2019)- The Legacy of Job’s wife is a dramatic book that is beautifully written by Cynthia J. Koelker. It is a cunningly crafted work of fiction that is based on the book of Job in the Bible. Thus, the main character in the story is not Job but his wife, Ix’ises. She is often remembered with her bitter words, “Curse God and die”. In this book, what she had been through- which led her to utter such profanity-is unfolded and vividly described. It is a fascinating story of love, patience, hope, faith, and gratitude. Even though I have already read the book of Job, every happening in this book is amazingly exciting. It’s like being eager about something that is predictable because of how every page leaves me wondering what is next. I can hardly put the book down. The captivating plot of the story moved me deeply. It reminded me of the beauty of life amidst any circumstances. I really liked the way the story points out that God’s plan-though rarely comprehensible to human understanding- is indeed the best and the most profound. It is an overwhelming story that made me cry a lot. The story stirred a lot of mixed emotions in me. The only issue I have with the book is its incomplete answer to the most important question about God and his will. Although this is just a work of fiction, I was just looking for some element of truth about God that should also be emphasized. This book will be very appealing to those who believe in God and his unfailing love. Also, to those who are losing hope and is going through a difficult phase in their life, this book may give light to what is incomprehensible. BL (5 Jan 2019)- This story can really speak to a wide variety of readers. Job’s work ethics and family values were stressed almost as much as his faith in God. No matter what belief system we have, there are so many things in our lives we can’t explain… We are not always deserving of the good that happens to us and are rarely deserving of the bad. This story gives hope that with consistent intentional transparent living we can overcome all things. A few of my favorite parts of the story… I enjoyed the aspect of forgiveness the author stressed as Job and his wife (more slowly) granted forgiveness to their friends that had abandoned them in their time of need. I think this was consistent with who Job and Ix’ises were and how they became successful and happy once again. I found the character, Hannah, very insightful and I liked how the author brought her words for her suffering back around at the end of the book, “…God doesn’t make mistakes”…Again, the author wove into the story a successful outcome for those that have suffering. ZE (22 Jan 2019)- It’s really intriguing and commendable to experience a biblical story from the perspective of a 21st-century writer. In Cynthia J. Koelker’s The Legacy of Job’s Wife, the substance of Job’s life with his wife is retold from a deeper and more relatable perspective. The book simply goes way back in time to present to us the fictitious evidential reason that led to the big statement Job’s wife made in the Bible: “Then said (Job’s) wife unto him, Dost thou still retain thine integrity? Curse God, and die”, Job 2:9 (KJV). Steadily, the plot takes us all the way back to Job’s childhood with Ix’ises and vividly illustrates how they both grew amongst the lushness of the country life, their relocation to the city of Uz, up until his moment of encounters with God. Without a doubt, one may categorize this novel as an extension of the book of Job in the bible because it gives a plausible detailed account of Job’s life before his tribulations. …The core of this inspirational work of art seems to be a reiteration of the biblical theme of redemption, trust, and love. The larger theme which encumbers other sub-themes revolves around the theme of redemption. This is because the plot of the entire story, which centers on Ix’ises’ pain and bitterness towards God opens up the intricate journey that leads to Job’s affliction and Ix’ises’ bitterness. One may suggest, therefore, that the book is a counter- explanation concerning one of the most despised and controversial women in the bible. With a steady unveiling of Ix’ises’ character, the author creatively convinces us to see things from another perspective. …How would I feel if the man I love is being undeservingly punished by a God I did not trust? How would I feel if I lost all my children in one day? This leads us to leverage on Ix’ises’ initially unbelief as a piece of evidence to the build-up of her blasphemous outburst in the book of Job 2:9 (KJV), “Dost thou still retain thine integrity? Curse God, and die”. The author inspires us to interact with the character of Ix’ises by making us aware of her initial unbelief in Job’s God and the reasons for it. Another mind-blowing part of the plot is the deep connection between Job and Ix’ises. I would describe their relationship as romantically satisfying yet so pure and sincere. A quick warning to every romantic soul who reads this book, you will definitely find yourself rooting for Job and Ix’ises!…After reading through, you may just find yourself desiring to meet a replica of ‘Mr. Romantic- Patient-Job’ in real life. …I would recommend this book to Christians and people who love to read historical novels. It might also serve as a good book for atheists and people of other religions because the book is essentially a good book with a well-crafted storyline. JTM (24 Jan 2019)- The magnificent part of this entire story is the way Koelker explores the emotions and actions of Ix’ises during her time of trials. When Job becomes sick, she continues to lie with him, even while his body becomes infested with maggots. What a picture of unconditional love! How quickly our emotions can change is shown when she visits him at the ash pile and wishes him to die. The ever-winding road of anger, grief, bitterness, and love are all shown in this story. …Exploring this beloved story from the wife’s perspective was a great way to show how people often deal with trials and crises in their own lives…Readers who love analyzing biblical stories or enjoy a triumphant story of a woman who has been dealt disaster will certainly need this book on their bookshelves.